Bradford Bulls are to appeal against their six-point deduction and will present their case to a specially-convened independent panel. The Super League club were docked the points in February after going into administration at the end of January. The Bulls have since been taken over by businessman Marc Green. The panel could uphold the current decision, decide to deduct the club fewer points or rule that there should be no points deduction at all. 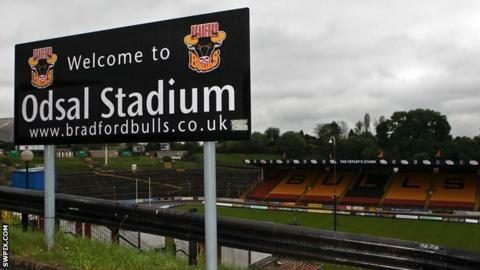 A Bulls club statement said: "Bradford Bulls can today announce their right of appeal against the club's points deduction has been granted by the sport's governing body. "The notice of intention to appeal was lodged with the Rugby Football League by former administrator David Wilson. However, the appeal could not proceed until the ownership of the club was resolved. "Following consultation with legal representatives, the new board have confirmed their intention to proceed with the appeal process and are now awaiting a hearing date." This is the first time a Super League side has lodged an appeal against a points deduction for entering administration. Bradford won two of their first three matches but have now lost their last five league games and are bottom of the table with minus two points. They host local rivals Leeds Rhinos on Thursday.